It’s been almost 9 months since I made a list of who I ranked as the 10 best boxers in all of boxing Pound for Pound (P4P). As always for those who will read my article and respond “WTF is Ralph Rimpell?” in a blog or comments section, please read my bio which is posted after reading the article. Quite a few interesting bouts have taken place since I wrote my last P4P article. Specifically, last Saturdays fight at the AT&T Center in Arlington, Texas between Garcia-Spence which has affected the P4P rankings. 1. 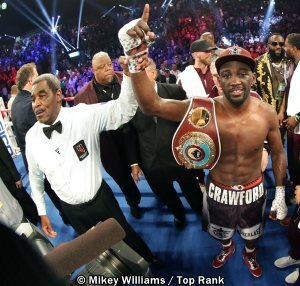 Terrance “Bud” Crawford (34-0, 25KOs) is the best fighter P4P in all of boxing. This writer envisions Crawford holding all 4 major titles at welterweight (WBA, WBC, WBO, and IBF) the same way he did in the 140lbs division. He faces Amir Kahn next month. Unless he has a bad night, he will walk through Kahn. Hopefully a fight between Crawford and Spence can be made in early 2020 for supremacy in the 147lbs pound division. 2. Gennady “Triple GGG” Golovkin (38-1-1, 34KOs). I said it the last time around and so I will say it again. Golovkin may not be the same fighter he was 2 or 3 years ago but he’s still an elite fighter. He had 2 fights with Canelo. The first fight he clearly won in the eyes of many, but was awarded a controversial draw. The second fight was close, but even though Canelo Alvarez did not do enough to win (in this writer’s view) he was awarded Golovkin’s middleweight titles. Golovkin should still be middleweight champion and have an undefeated record. DAZN signed Golovkin to a 6 fight deal no doubt to fight the best fighters in the world. Until he truly loses or wins against any those fighters he stays at # 2 on this P4P list. 3. Whanheng Meynayothin (52-0, 18 KOs) – Meynayothin is 52-0! It seems every influential Promoter and network has ignored this fighter. He has beaten everyone put in his path. This writer will not ignore this fighter. He could easily be ranked either P4P # 1 or # 2 if he had unified his division and became undisputed mini flyweight champion while amassing his victories. That is one of the factors that separates Meynayothin from Crawford and Golovkin. He must continue to win and unify his division to move up on this list. 4. Vasyl Lomachenko – (12-1, 9KOs) after 13 fights he has won world championships in 3 weight classes! Who does that after only 13 fights? Only special and great fighters do that. (Mikey) Garcia-Lomachenko can be a super fight if Garcia decides to drop back down from welterweight to lightweight after his recent loss to Errol Spence. Hopefully politics won’t interfere with this fight being made this time if Garcia comes back to the 135lb division. 5. Errol Spence Jr. (25-0, 21KOs) – Is IBF champ at 147lbs and I previously had ranked Spence # 9 the last time around. He is now ranked # 5 because of his dominant performance over 4 division champ and future hall of famer Mikey Garcia. If anyone disagrees and wants to say Spence should be ranked above Lomachenko, Meynayothin, Golovkin, and Crawford, then all he has to do is defeat Crawford. Fair enough? For now this is where he ranks. 6. Saul “Canelo” Alvarez (51-1-2, 35KOs) whether one agrees with the outcome of his last two fights against Golovkin, he is the reigning middleweight champion and WBA super middleweight champion. He has won titles in 3 divisions. He signed a record deal with DAZN. He is obviously taking on all comers (as a true champion should). He will next face Daniel Jacobs his IBF middleweight counterpart in May 2019. If he can defeat Jacobs in spectacular fashion and sends Golovkin into retirement in a rubber match (3rd fight), then Canelo moves up on this list. 7. Mikey Garcia (38-1, 30KOs) has ballz of steel for moving up in weight to challenging IBF King Errol Spence! When Thomas Hearns moved up in weight to challenge Marvin Hagler he lost. When Michael Spinks moved up in weight to challenge Larry Holmes he won. The point is the outcome of a fight can go either way (win or loss). One never knows with these situations. Garcia has won world titles in 4 weight classes. In this writer’s opinion he can remain and fight someone like Shawn Porter for his belt (WBC) and win, look for another big fight at welterweight (i.e. Pacquiao), or he can drop to the lower weights in search of a another big fight (i.e. Lomachenko). For now he drops to # 7 on this list because of his recent loss to Spence. 8. Floyd Mayweather (50-0, 27KOs) Why not on this list? He and his representatives say that he’s retired. A couple of weeks ago, Pacquiao said their camps are negotiating a rematch to their 2015 fight. Mayweather may be 42, but he is a well preserved 42 as is rumored he does not abuse his body. He may be flirting with a comeback. It’s more like Mayweather is a young 34 year old and he reportedly still spars and runs. He stays on this list because with his skill level he could conceivably beat any top welterweight in the world today if he were to unretire as is rumored he will. 9. Manny “Pac Man” Pacquiao (60-7, 2, 38KOs) Since the controversial loss in Australia to Jeff Horn which cost Pacquiao his WBO welterweight title, Pacquiao has won another world title (WBA) and beat 4 division champion and future Hall of famer Adrian Broner. As I told “Nay Sayers” who wrote Pacquiao off as “finished”, “shot”, and “washed up” after the Horn fight that Pacquiao was still fighting on an elite level. Hopefully Pacquiao gets the rematch against Mayweather before he retires and other big fights. 10. Keith Thurman (29-0-1, 22KOs) was sidelined for almost 2 years. He drops down to # 10. With heart and ballz he managed to earn hard fought 12 round majority decision victory over Josesito Lopez back in January which was his comeback fight. Thurman has his work cut out for him if he wants to ascend this P4P list. That would involve unifying the title by beating Spence, Crawford, or Pacquiao. ***Ralph Rimpell is a writer based out of New York and is a Boxing Correspondent for Philboxing.com. Ralph holds an undergraduate degree from City University of New York. He has been a Boxing Writer for over ten years having written for several top boxing websites on the World Wide Web. Before becoming a writer, Ralph's passion was for professional wrestling until he realized professional wrestling was entertainment and not a real sport. It was at that time the 1984 US Olympic team made up of future stars such as Evander Holyfield, Meldrick Taylor, Pernell Whitaker, etc. entered the professional ranks and signed with promotional outfit Main Events.It was also at that time a young exciting Heavyweight originally hailing from Brooklyn named Mike Tyson also turned professional and became the face of boxing. Young boxing fan Ralph just couldn't get enough of boxing as a large part of it was being broadcast on "free TV". As time went on, Ralph felt boxing writers were not being forthcoming with their boxing coverage, opinion pieces, interviews, etc. So Ralph decided to write an article and submitted it to a Boxing website thinking it would be deleted and ignored by the Editor. To Ralph's surprise his article was posted on their website and the readers embraced it. The rest is history. Click here to view a list of other articles written by Ralph Rimpell.